The ovarian cancer has been categorized into different types and stages according to their origin, sizes and locations. The post here contains the information about the ovarian cancer stages and the ovarian cancer types. There are more than 30 types of ovarian cancer which have been categorized on the basis of the cells they get developed from. These cells have been divided into three categories and accordingly the type of ovarian cancer. Surface Epithelium Tumor: Cancer develops in the cells that cover the lining of the ovaries. Germ Cells Tumor: Cancer develops in the cells that form eggs. Stromal Cell Tumor: Cancer that develops in the cells that release the hormones and connect the different structure of the ovaries. It is the most common and dangerous cancer of all the type of ovarian cancer found in the ovary. This type starts from the surface (outer layer) of the ovary. Usually, these cancers do not show any kind of early symptoms and 70% of the cases they are found in the advanced stage. These kinds of the tumors develop in the cells that produce eggs and can also remain benign (non-cancerous). However, there are some germ cell tumor that can be cancerous and life threatening. These are often found in teenagers and women in their 20s. These tumors are rare and develop in the connective tissue cells that put/hold the ovary together. These cells are also responsible for producing the hormones, like, estrogen and progesterone. The cancer can be found in its early stage and is limited to one of the ovaries. The stages of ovarian cancer are categorized on the basis of the size and location of the tumor. The first stage of the ovarian cancer is categorized into three different levels, where the cancer's growth is limited within the ovary. 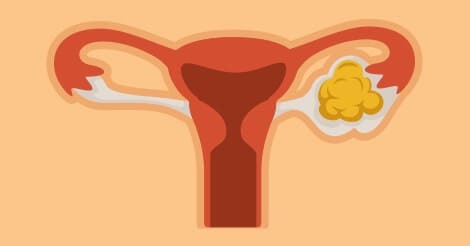 In this stage, the cancer starts growing within the ovary and there are no signs of cancer on the surface of the ovary. There is still no tumor outside of the ovary and the cancer grows within both the ovaries. There is no sign of ascites (build-up of fluid in the membrane around abdomen) containing the injurious cells and the capsule is unharmed. In this stage, either the tumor is present on the outer surface of the ovary or the capsule is damaged. The second stage is also categorized into three levels according to the growth of the cancer. The cancer has spread to the uterus or fallopian tubes. The cancer has grown to the other nearby organs. In this stage, either the tumor has grown to the surface of the ovary (or both of the ovaries) or the capsule has ruptured. In the stage, the cancer can be seen in the ovary but is not grossly visible in the abdomen and it has not spread to the lymph nodes nearby. This can be found in both of the ovaries, the deposits of this tumor can be found in the abdomen and has the size that is clearly visible without a microscope (not larger than 2cm). The tumor has not grown to the nearby lymph nodes. In this stage, either the tumor has spread to the lymph nodes and/or the deposit of the cancer has grown to the size more than 2 cm and is found in the abdomen. This is the last and most advanced stage of the ovarian cancer where the cancer has grown to one or both of the ovaries and to the organs outside of the peritoneal cavity also. The cancer can also be found in the fluid surrounding the lungs. Ovarian cancer is a leading cause of tumor-related death among women. The stage and type of ovarian cancer gives insights about how big it is and how much it has spread. In addition, it aids your doctor to decide the effective treatment. Depending on the need, stage, and type of cancer, you will be asked to undergo more screenings and blood work. In such cases, taking complete health checkup package by Indus Health Plus can help. To know more about it, fill the inquiry form and we will get back to you.